Have you ever tried to hassle with documents attached to emails? In publishing, it can be an absolute nightmare. One manuscript may come as one document, while another may come as five or six. And, just forget collecting recipes for that new cookbook. Things are constantly getting lost or “archiving” themselves. So this Saturday finds me up at the office with the blinds shut on my window while getting caught up on a variety of things that I didn’t get done during this four-day week that had a two-day trip out to Abilene wedged into it to discuss all things wind energy: approving pending requisitions, sending out belated emails, and closing out weekly reports. Plus, to top it all off, with all the running around, I didn’t even remotely have time to watch over my rss feeds like I normally would so that’s why this is the semi-latest publishing news as it comes from the week of March 22-26. On the other hand, this week’s news has been dominated by all things iPad and until I actually get to play around with one, I’ll try to stay out of that discussion. Categories best practices, blogs about publishing, book publishing industry news, e-books, e-readers, recommended book resources, recommended business resources, recommended publishing resources, textbooks, You Should Read . . .
Social media. Social media. Social media. Nine times out of ten I want to scream, Enough already! Every day new apps are coming out . . . and while most of them are at least moderately interesting, who has the time (or energy) to incorporate all these applications springing up like mushrooms? Between blogging, Facebook, and Twitter alone (plus the concomitant bit.ly, Statcounter, Feedburner, Flickr, Twitpic, and more), it’s not exactly the best return on investment to spend even more time gathering, sending, and responding to content flying around the Internet. I mean, unless you’re a social media manager who’s paid to develop carpal tunnel syndrome and have eyes as watery and red as a hamster’s, we really all do have our regular jobs to do! I’ll be the first to admit that personally I’m a pretty slow adopter of new technologies. I finally broke down and bought a cell phone barely two years ago (if it was even that far back). Until last year ago I still had my $9.95 a month dial-up Internet service. I’ve yet to hold a Kindle, much less read a book on one. A big part of it is that it’s hard to tell exactly what the Next Big Thing is vs. just the Next Big Hype and what’s worth your time vs. just being a waste of time. Plus, when talking about tech gadgets or Web-based applications, you have the tech geeks who love anything as long as it’s the absolutely newest thing around however impractical, convoluted, and/or nonsensical it may be. (In fact, they’ll love it all the more for being exactly those things.) Then you have your average (that is, normal) person who likes new applications/gadgets that are both simple and powerful. Falling into this latter category, I will happily admit, is Twitter, which we got one of our authors, Terry Cooper (better known as The Texas RV Professor), set up on this week. On the brighter side, now that we’ve got broadband at home I have dived feet first into the podcast section at iTunes and have been downloading hundreds of different podcasts on publishing, business, management, marketing, project management, and other related subjects. 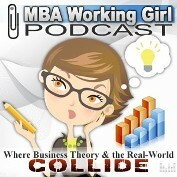 And for sure, there’s one series of podcasts I’ve happily subscribed (and listened) to: MBA Working Girl Podcast. Many thanks are due to Lori Cates Hand (of the Publishing Careers blog) who graciously presented us with an Excellent Blogger Award earlier today. Lori is a 17-year-veteran of book publishing whose blog aims, in her own words, be an “online ‘informational interview’ for college students, new graduates, and career changers interested in knowing what a job in publishing is like and how they can get one.” For anyone interested in publishing (or who is in publishing already) it’s a good read that I can highly recommend. One of the duties, however, when receiving the Excellent Blogger Award, is to award it to 10 other bloggers to whom you feel it should be rightfully bestowed. So, in no particular order, these are the 10 best blogs about publishing that I think not only deserve the Excellent Blogger Award but should be read on a regular basis as well. This blog contains the thoughts and opinions of the staff of TSTC Publishing and does not represent official Texas State Technical College policy.